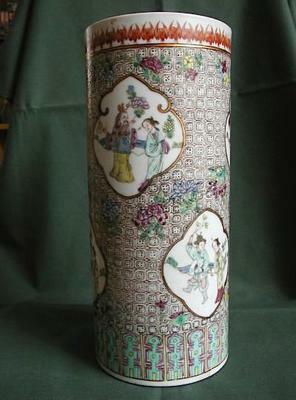 I have numerous Chinese vases, mostly hatstands. These are largely of the more common types of patterns, but one is decorated very differently. A pattern of tiny fine black squares, some containing four small red dots, some containing five, cover the vase completely. Painted flowers are strewn over these squares and numerous cartouches bearing figures add further decoration. 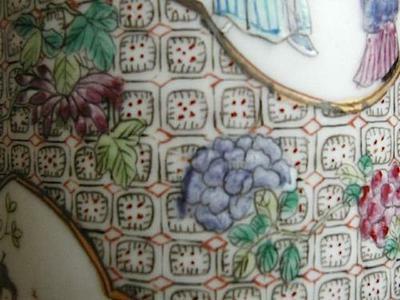 The top of the vase is encircled by a border in red, whilst the bottom is bordered in green and purple. 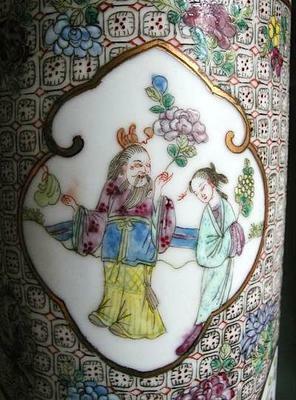 The vase seems to have been once one of a pair, as it is unmarked. Can you provide any information about this vase, please? Thank you, Peter. Yes, I think that might well be the case, as I have never seen another hatstand decorated in this way. I bought the piece over 20 years ago in Brussels (I used to live in Belgium). When you say "fake," do you mean it was not made in China, or simply that it is made to look older than it really is? The strange thing is that, of all the hatstands I have, this is one of my favourites! They imitate the faces/eyes of late Qing items, but overall the proportions and colors don't seem quite right. This looks like a 20th century imitation trying to look like a late Qing dynasty item. The way the people, especially the left one, are painted is typical for fakes. A few decades old at the most, I'm afraid. 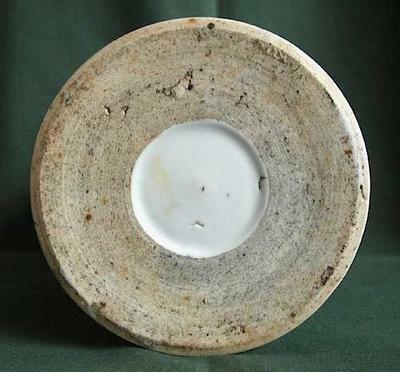 The decoration is not something traditional Chinese, and the bottom looks a bit too "rough".